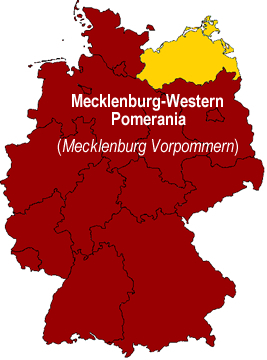 The state of Mecklenburg-Western Pomerania (Mecklenburg Vorpommen) lies in the northeastern part of Germany. The state is bordered by the German states of Lower Saxony (Niedersachsen), Brandenburg, and Schleswig-Holstein, as well as the Baltic Sea and Poland. The state of Mecklenburg-Western Pomerania was first formed in 1945 after World War II within the Soviet occupation zone. The state was formed by joining the regions of Mecklenburg with Western Pomerania. The Mecklenburg region has a history dating back 1,000 years and was once owned by a grand duke (19th century). Western Pomerania belonged to Prussia before it was taken over by Germany. In 1952, the state was broken down into smaller administrative districts by the German Democratic Republic (East Germany). The German Reunification in 1990 brought the administrative districts together again and the Mecklenburg-Western Pomerania was again established as a German state. 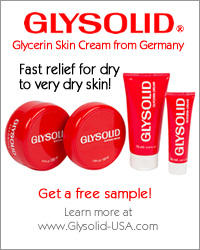 It is one of Germany's newest states. Mecklenburg-Western Pomerania is shaped by water. It has the longest coastline of all the German states. Its lakeland region is Germany's largest area of lakes. More than one thousand lakes, both large and small, are connected to each other by rivers and canals. Lake Müritz is the state's and Germany's largest lake. Many islands are also found in Mecklenburg-Western Pomerania. The most well known islands are Rügen, Usedom, and Hiddensee. Rügen is the state's and Germany's largest island. It is actually made up of a group of 30 small islands and peninsulas in the Baltic Sea. This island belonged to Sweden for about 200 years, which is why it is nicknamed "Southern Sweden." The cuisine in Mecklenburg-Western Pomerania (Mecklenburg Vorpommen) is rich and hearty. Meat is used abundantly, as well as bacon and butter. Ham and wurst also play an important role in the cuisine here. Plums, pears, raisins, and apples are used as seasonings and side dishes for roasts. Given the state's large amount of water from its lakes, rivers, and coastline, fish plays a large role in the cuisine. In the coastal regions, herring, mackerel, and flounder are the favorites, while perch, walleye, trout, and eel are the favorites inland. The state's large forest areas provide its cuisine with a variety of game. Among the favorites are venison and wild boar. A real Mecklenburg meal always includes potatoes, which is the favorite side dish here. Rice, dumplings, and noodles are usually only made from a package and then only when there is little time to prepare a "real" meal. 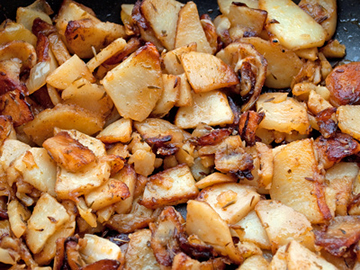 But the locals would take pan fried potatoes made with bacon over these other side dishes in a heartbeat. Other important vegetables here include kale, cabbage, beets, mushrooms, and beans. A list of popular foods and dishes in Mecklenburg-Western Pomerania (Mecklenburg Vorpommen) are listed below. The five largest cities (in terms of population) of the state of Mecklenburg-Western Pomerania (Mecklenburg Vorpommen) are listed below. Rostock is the largest city in Mecklenburg-Western Pomerania. It has a population of 200,000 (as of December 2006). Rostock is one of Northern Europe's oldest cities, dating back to the 11th century. Its university, the University of Rostock, was established in 1419. Rostock is a coastal town. Important industries for the city include tourism, service and hospitality, and ship building. Schwerin is capital of Mecklenburg-Western Pomerania and its second largest city. It has a population of 96,000 (as of December 2006). It is Germany's smallest capital city. Schwerin is well-known for the Schwerin Castle. It was once the residence for the duke from Mecklenburg. Since 1990, it has been used as a legislative assemby building of the state. Neubrandenburg, the third largest city in Mecklenburg-Western Pomerania, has a population of 67,000 (as of December 2006). Mecklenburg-Western Pomerania's fourth largest city is Stralsund, which has a population of 58,000 (as of December 2006). Griefswald is the fifth largest city in Mecklenburg-Western Pomerania. It has a population of 53,000 (as of December 2006).